Two roads on the south side of the Columbia River are closer to the gorge than this one. But this one climbs higher and has more views of the volcanoes, but also fewer of the inner workings of the Columbia Gorge. This seems to be a fairly popular ride. I encountered quite a few other bicycles. 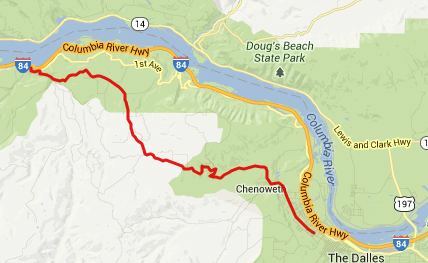 This route easily lends itself to a loop with the US30 Rowena Crest s(u). From West. From Mosier 3rd Ave leads onto State Road. As the road climbs it can give some really interesting distant views of both Mount Hood and Mount Saint Hellens. A special road side attraction is waiting near the summit. A art gallery of stick figures on bicycles line the road. Actually it's just the yard of an enterprising metal worker. But still - where can I sign up to donate an old bicycle to this new art movement ? From here it's not far to where the road jogs left and opens up the view shed onto the Coumbia River and the Dalles. From East. (described downwards) A number of switchbacks show off new vantage points onto the drier landscape of prarie hills, east of the Columbia Gorge. The road rolls into the Dalles, which has about every business imaginable and a nice park on the Columbia river, perfect for a picnic. Seven Mile Hill Road(sh?) , Wilson Road - Huskey Road(sh?) : Wilson Road - Huskey Road(sh?) > down Wilson Road > up State Road > Seven Mile Hill Road(sh?) > several detours around the Dalles > Wa197 north > Dallesport > Wa14 west > Bingen > Hood River Bridge > Hood River > old Historic Columbia Highway trail > up Huskey Road > back to starting point: 67.2miles with 4880ft of climbing in 5:50hr (VDO MC1.0 m5:13.8.17). Notes: The unpaved part of this ride is easily skipped by just going up State Road from Mosier. I was thinking that this was the perfect day loop through the Columbia Gorge. Wa14 on the other side also has a good shoulder for cycling. It's fairly busy but not nearly as busy as the coast. But then I discovered that getting back to the Oregon side over Hood River Bridge required breaking the law: no bicycles allowed. The manned toll booths are all on the Oregon side, and it would have been kind of silly to send me back and break the law again. So, then how do you construct a nice day loop over old Historic Columbia Highway multi use trail ? ( also called something Hatffield trail) ? By the way, that trail climbs only about 400ft over the river. - According to my altimeter the Seven Mile Hill Road summit point is 9ft higher than the Wilson Rd - Huskey Rd(sh) point (obviously the margin of error is much higher than that).